The clementines are finally in! I was so excited to see them that I picked up my little wooden box from the grocery, slid it into the fridge and completely forgot about them–what with all the cookies, layer cakes and cheese balls roaming around–until today, when I remembered I had five pounds of clementines that needed to be eaten ASAP. Five sweet, easy to peel, practically seedless pounds of orangey potential. 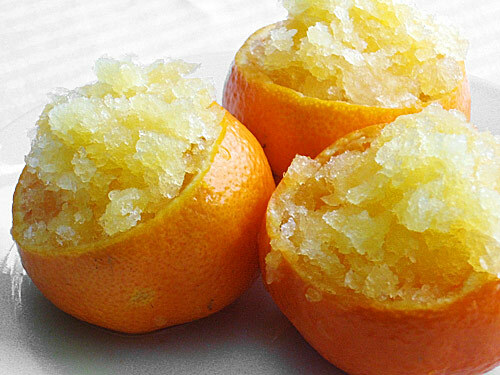 The perfect opportunity to try a Clementine Granita. Yes, I know it’s cold outside, snowy even, but hang with me. All this dessert requires is clementine juice, sugar, maybe a little rum, and four to six hours in the freezer. Every few hours, you rake a fork through the mixture. That’s it. But this simple dessert is so light, so cold and so packed with magical clementine flavor … It could shake up a brunch, soothe a sore throat or be the perfect non-gut-busting ending to a heavy winter meal. Combine clementine juice, sugar and rum, if desired, stirring to dissolve the sugar. Adjust the sweetness with more sugar, if needed. Pour mixture into a 9-inch square pan or dish. Freeze, stirring and crushing lumps with a fork every few hours. Serve in hollowed out clementine rounds, if desired. These look perfect as a Peruvian summer treat! What fun! This actually sounds like the perfect antidote for all things rich and chocolate-y. So refreshing! YUM!! I could surely use some of this for my sore throat right now. That’s so cute! I agree, a light dessert is perfect after heavy winter meals. Delicious! I have been meaning to make granita for a while. Counter-intuitive I know, but I love it in Winter. It reminds me of eating freshly fallen snow…much much tastier freshly fallen snow. Hi! I stumbled on your blog via Tastespotting.com. The photo is great, and the recipe seems delicious but it was totally the blog name that got me here. Nicely done! I love how you served them in a clementine. It would be the perfect thing to savor between decadent courses! These look so refreshing. I need to start eating less desserts made with butter :) Happy Holidays! Gretchen Noelle: I couldn’t believe how easy this was to make. Might have to freeze some slices and/or juice for summer in the states. Laura: I needed something without chocolate! I’ve eaten enough bourbon balls, my blood is probably 40 proof. Tami: Hope your throat’s feeling better! Erin: It DOES remind me of snow. And we’re in the 70s right now in Tennessee, so granita doesn’t seem like such an anomaly. Greg: Welcome! Glad you like the blog name. I couldn’t believe it was free. Megan: Amen, Sister, on the rich foods. Any more cheese, and I’ll grow a third buttock. Shari: Isn’t it cute in the clementines? Emeril has the best ideas sometimes. Summer: You and me both, Sister. Happy Holidays to you! Jacque: It’s been dark and dreary here for two or three weeks, which should be illegal. Needed those clementines to pep me up. I can’t tell you how many pounds of clementines I’ve eaten in the past month or so. I lost count of the boxes at 7… and that was a few weeks ago. The granita sounds wonderful! Cat: They are sooooo good. I keep meaning to make a clementine cake, but that seems like a waste of freshness. I’ve read that you can freeze the slices, though. Might have to look into that before they’re gone. These sound great! They seem easy to make too!